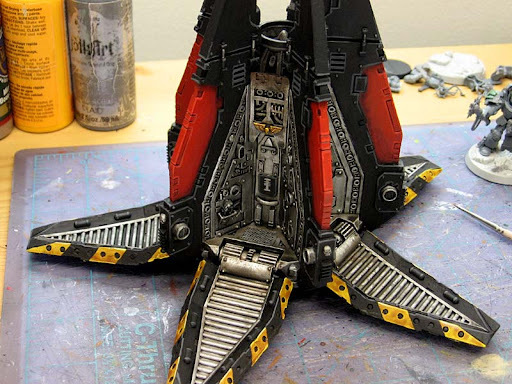 I figured I would share with you guys how I went about painting the hazard stripes around the seals of the hatches on the drop pod I've been working on lately. I know someone's probably going to ask how it was done and you don't see many people using hazard stripes on their stuff. I think that's because they can be a bit of a pain to paint. The first step was getting a good base color down. I went with a light tan color because I didn't want that bright, clean look that comes with using white as a base. With the base color down, I added the "yellow." The yellow I use is almost transparent but with the base color I picked, it was no problem at all. One coat and I was ready to move on. Once the yellow was dry, I washed it twice with Gryphonne Sepia to give it that "dirty" look. Here's the tricky part, the stripes. I decided I wanted mine to be fairly large and I wanted the angle of the stripes to be slightly different than the ramp itself. I picked two points, one along the bottom edge (A) and one along the top edge (B) and connected the dots to make my lines. If you look closely, you'll see that all the "A" marks are directly underneath one of the circular openings along the edge. All of the "B" marks are inbetween two openings. Each set of marks is two openings wide and I just followed that pattern the whole way up the ramp. And presto, all the stripes are the same angle and width the whole way up. A little bit of highlighting for the black stripe and some for the yellow and I was all set. I still need to add some damage to the ramp, but that will come at the very end. 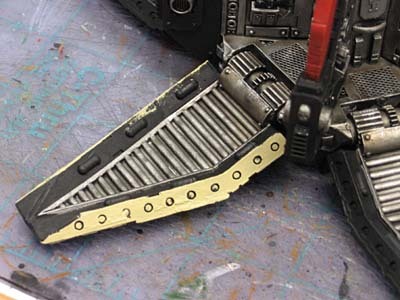 Now I know why you don't see very many all drop pod armies with fully painted pods. Nice, job! The drop pod looks great. I did almost exactly the same thing with mine even down to the sepia wash. I did use masking tape to get the lines straight though. Easy enough but time consuming but worth it in the end. I know painting a large model with lots of detail can get old very quickly, but as impressive as this piece is looking, it's worth it. I wish I could achieve the same look as quickly, but I'm notoriously slow with a brush. 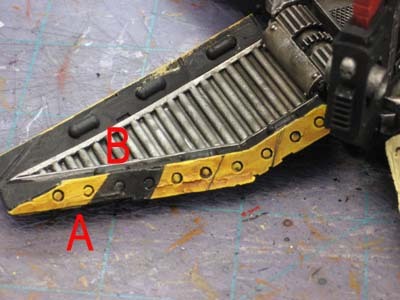 I am curious though as to why you painted the whole length of the caution stripe first tan, then yellow over black, then painted black over the yellow? Seems to me a bit more work for the same look. the Othe Kevin: Charles is right, the tan was so the yellow didn;t need to ahve 100 coats to get it opaque. It's easier to paint the whole thing yellow first and then cut in with the balck stripes (since it's an opaque color) and covers in one pass. Thanks for the useful hints on painting yellow. I have always avoided painting anything yellow like the plague. 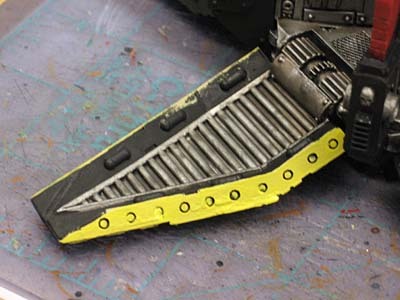 What are your thoughts on GW's Foundation Yellow for a base color? I don't know if I've mentioned this recently - but I loves me some "From the Warp"! A great blog roll, good posts and handy tutorials -- all without bludgeoning us with ads and spam. This tutorial is a great example of how a good looking effect can be easily achieved. Thank you AGAIN for posting it. I used Iyanden Darksun for my yellow stripes. Like Scriv, I used strips of blue painter's masking tape to get nice straight lines. One question, semi-related, to the wash you're using. I make my own washes, and I'm trying to figure out what would be closest to Gryphon Sepia. Burnt Umber perhaps? I use 5 parts water, 1-2 parts Future floor wax (for the self leveling/anti-pooling factor), and add paint to taste. It hasn't done me wrong yet, but I really like that dirty brown look you're rocking on the Yellow as well as the Boltgun Metal. Your models always look fantastic. 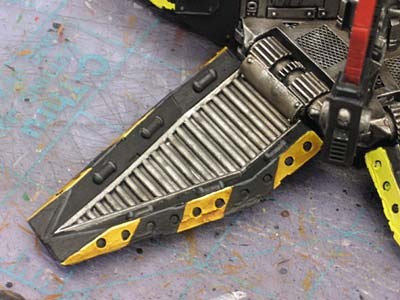 My question to you is how would you go about doing hazard stripes on non straight surfaces, such as Terminator Powerfists. I am doing some at the moment and having an absolute devil of a time. @RuntMcRory: The painters' tape technique works wonderfully on rounded surfaces. Longscope: It depends on whether you want a warm or a cool brown wash. I think you might do best by trying a couple different ones. I will use either the Devlan Mud (cool) or Gryphonne Sepia (warm) when I wash things. The key being the last one you use will have the most effect I've found in making it look warm or cool. RuntMcRory: Good question, powerfists can be a bit harder. I would do the same process as this here. I might start by drawing a line down the middle of the object and then working to the left and right from there as opposed to starting at one end like I did here. If you start in the middle with a smaller object (like a powerfist), even if your lines are little off, it won't be that bad since the middle is "correct."